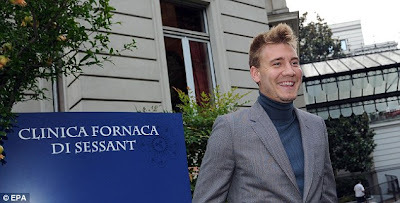 The gist is that Arsenal outcast Nicklas Bendtner has been branded too fat by Juventus coaching staff just days after signing up for a season-long loan. The Denmark striker was given permission by Arsenal manager Arsene Wenger to miss a large portion of summer training in order to find himself a new club following his year on loan at Sunderland. But the lack of pre-season conditioning has caught up with the twenty four years old Dane with Juve coaches saying he is carrying too much weight to play in Serie A. In addition to worries over Bendtner’s waistline, former Juve midfielder Alessio Tacchinardi has questioned what impact the self-styled ‘best striker in the world’ would have in Turin. The question is this. Why sign him when you re not even sure of his fitness level. It doesn't make sense at all. In any case, selling Bendtner and fellow flop Andrey Arshavin were two key summer objectives for Arsenal, given their respective wages of £52,000 and £80,000 a week. But, while the club offloaded the Dane on loan, they have struggled to find a buyer for Arshavin.